And Me, in that place, is merely observing… not a rift nor a ripple, no impact. Ah, here it is. Am I that – moving through this world without leaving a footprint? A wish or a regret? No imprint of me in my space? Or a free spirit afloat, not belonging nor caged…? Beyond it all, my presence (if you can by definition call it that) unnoticed. Unnoticed by whom, you ask. There is no one in my vision. A sense of forlorn… no, not a correct word. It is… the lightness of nothing-ness, the beauty of what is, the alone-ness of being. I seek to understand my desire for silence. Freud would ask for free associations – to what do I associate when I hear the word ‘silence’ – so here goes… peace, calm, me, together, whole, free, no obligation… Yes, perhaps years of therapy may shed light on this 🙂 … but perhaps it just is. While our mind does not comprehend, our spirit may embrace. So why? 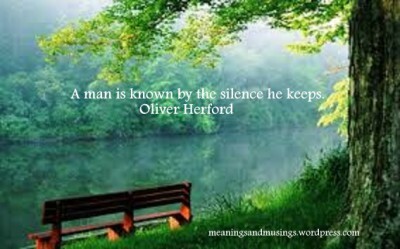 What does silence say of the (wo)man that keeps it? Perhaps it is my belief and practice (I try) of only speaking what matters, what needs saying. If they do not serve a purpose, no word is required. The person who is able to discern the effects of his words and when to hold his words has my respect. Yes, I have had my share of reacting – blurting words of hurt, anger, mockery, injury… I guess we all have. We are humans after all. Ever wonder what motivates our speech? For whom do we speak? For ourselves so we feel ‘good’ for one reason or another? For others that is, to comfort, to care…? I have found that sometimes words of sympathy do not serve the other, sometimes our presence of being is all that is needed. Just silence. I know from experience, the knowledge of another’s presence is comfort enough, sometimes words are not required. The love is in the being present. This world privileges, and at times abuses, self-expression… taking to spoken words, loud and proud. In fact, it is cultural to associate speaking out as signs of wisdom, intelligence, boldness, creativity, innocence, truth… And the reverse is assumed to apply to those who are silent. Imagine one who has no need to speak in order to gain approval, no need to concur to please and gain ‘acceptance’, no need to criticise in order to self-validate… Imagine being sufficiently self-aware to know the essence of one’s words and actions, be they harmless or injurious, to reflect and learn from them; and self-assured to seek no favour nor fear the world’s rejection. After all the above, the point is… what, you ask? It is this affirmation. Open your eyes and truly see the person who keeps her silence. Do you hear her? Wonderful stuff, Florence. A great read for the end of my Monday afternoon. 🙂 thanks, Hugh. Hope you are all plugged in and connected now? I’m back in Hove now where it’s business as usual with broadband. Back to Wales on Saturday and hoping to be connected again on July 6th. Keep your fingers crossed for me Florence. 🙂 I hate being without a proper broadband connection.